For the life of my two mobile devices (iPhone and iPad) I have had protective covers on both. I was afraid the beautiful clear glass would get scratched. After two years the cover on my iPhone got so scratched up that I decided to replace it with a new cover. Carefully, I peeled the old cover off with the new one nearby and ready. Once the old cover was off I was absolutely amazed at how clear, clean, and fresh the phone looked. It looked almost brand new! I could hear Johnny Nash singing "I Can See Clearly Now" in the background. The protective cover went into the trash. Needless to say, the cover came off the iPad as well. What a difference it makes when you remove the protective cover! I wonder what other ways fear has caused me to apply a protective cover to create a distorted image and miss blessings that were available to me? When I meet new people do I have a fear-filter that causes me to see and hear what others have said about them? Do I allow preconceived ideas and prejudices to determine how I react or respond to them? Do my defense mechanisms cause me to be defensive and cautious? Do my assumptions prevent me from seeing anything new about them? Do I view my relationships through a protective coating? Never quite sure if people are genuine? Always wondering if they can be trusted? Do I put the protective cover over me so they do not see me as I really am? Am I afraid to let them see the real me? Do I do this, or try to do this, with God? When I am in a strange place, does the fear of what I have heard about that area cause me to be guarded and so cautious that I miss the beauty of what is right in front of me? Do I allow the fear of what may or may not happen paralyze me? When problems, obstacles, and challenges confront me do I allow my fear of making a mistake to keep me from doing anything? Do I allow my fear of failure to keep me from experiencing a new adventure? Do my past experiences determine my future decisions? What about when I read Scripture? Am I afraid that I might see something I have never seen? Am I afraid that a new understanding will force me to change not only my thinking, but also my lifestyle? Am I so concerned about maintaining the status quo that I ignore truths that I have never seen? Am I so concerned about offending someone that I refuse to acknowledge what God is saying to me? To them? To the church? Fear is a killer! But, it does not have to be. Of course there is a place and time to heed the warnings, to listen to those who caution us, and to refrain from ill-advised activity. But, fear can keep us from seeing truth when it is right in front of us. Fear can prevent us from doing good when we know we should act. Fear can blind us to blessings, opportunities, and life abundantly. 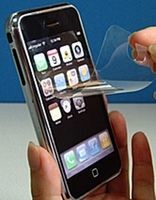 Here is a suggestion: Take the protective cover off! Be confident in the God who created you. He has empowered you to not only know the difference between right and wrong, but to do right even in the face of wrong. He will give you answers. He will guide your wisdom. He will direct your steps. Who Thanks God for This? "Protective Covering?" by Tom Norvell is licensed under a Creative Commons License. Heartlight encourages you to share this material with others in church bulletins, personal emails, and other non-commercial uses. Please see our Usage Guidelines for more information.